Loath and loathe have tendency to confuse your mind. You may be confused choosing which one is verb and which one is adjective. In this post, we will discuss more about these two word and try to eliminate all doubts about the words. Loath can also be written as loth. But it is not in current usage. Loath is an adjective. It means unwilling, not in the mood, reluctant. You loath to learn math, it means you don't want to learn math. If you are loath to do something, you do not want to do it. I am loath to admit my mistake. My daughter was loath to let her dog leave. The finance minister seems loath to cut income tax. Loathe is a verb. It means to dislike, detest, hate. If you don't like something or someone, you loathe them. The two women loathe each other every time. I loathe going to school. Loath is an adjective; it is used with infinitive with linking verb, am, are, is, seem, like "He is loath to learn English, Our government is loath to develop our education system". Loathe is an verb. It is used as infinitive (with to) and bare infinitive (without to): "to loathe deeply, intensely; she loathes working in the house". We will learn the word loathe with the help of word hate. As we know that Loathe means to hate something. If you pay attention on these two words: loath and loathe, you will see an "e" at the end of both of the words. 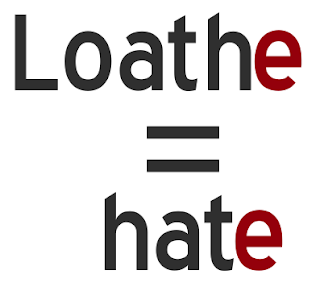 With the help of this "e", we can learn the meaning of Loathe easily: Loathe = To hate. Loathe means to dislike something or someone. We can learn the word loathe with trick: Loathe and hate have the same "e" at their end. We all know that loathe means to hate.